U.S. designer and architect born in Vienna, Austria, where he studied at the Royal Academy of Fine Arts, and studied architecture at the Polytechnicum. His colleagues included architects Otto Wagner, Adolph Loos, and Joseph Hoffman. He co-founded the Hogenbund in 1901 as a rival to the more famous Vienna Secession founded by Hoffman. Urban became one of the most significant stage designers of the early 20th century. He first came to America in 1904 to create the Austrian pavilion for the St. Louis Fair. 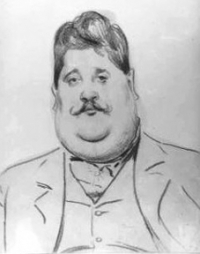 He gained a reputation as an illustrator for children’s books from 1905 to 1914. In 1911 the Boston Opera Company brought him to America design its sets, and he immigrated permanently to the U.S. in 1912. In 1914 he was engaged by Florenz Ziegfeld in New York to create ‘Art Deco’ style sets for the Ziegfeld Follies from 1915 to 1931. The theatrical lighting color gel, Urban Blue (Roscolux # 81) was named after him. William Randolph Hearst was an important client and supporter. He engaged Urban as art director for his movie studio (1919-1925). Urban also worked as an architect, designing the Ziegfeld Theatre (1926-1927) and numerous private homes and public buildings. He climaxed his career by designing the color treatment of the Century of Progress Exhibition in Chicago in 1933.